In 2014 alone, the USDA reported that approximately $161.6 billion of food was wasted in the United States. This amount equates to about 133 billion pounds of food. If you’re in the hospitality and food service business, food waste and unsustainable practices can be very costly. Utilizing sustainable processes can not only reduce your amount of waste, but can also save your company money. The Washington Post reported that diners in the foodservice industry leave an average of 17% of their meal uneaten. This is a substantial amount of waste that often gets dumped in landfills. No matter what size your business may be, you can use multiple waste disposal bins to encourage more sustainable practices on both the customer and business side. Compost, recycling, and trash bins are the standard in many establishments. Compost, in particular, can include certain types of materials such as napkins, plates, and cups. It can also include 100% recyclable materials such as napkins, wax paper cups, cups for hot drinks, paper containers, and hot stirs. Although using multiple waste bins isn’t a new or revolutionary concept, it is an easy step to a greener business. Especially if you’re in the restaurant business, this may not be an entirely new idea. However, if your business is currently using plastic materials, switching to reusable materials minimizes the generation of waste. Simply using reusable coffee filters, coasters, and tableware can also save your business money that would have gone into frequently purchasing unsustainable materials. Also, if your business is looking to go the extra mile and to reuse bigger materials, you may want to consider using wooden tables rather than replacing linen cloths between dining service. Since kitchens are some of the main offenders of generating food waste, recycling and composting from the source can prevent hundreds of pounds of food and unsustainable materials from going straight to the trash. Scraps from produce can oftentimes be repurposed into other meals to save food. Additionally, some states compensate consumers and businesses for recycling certain types of aluminum cans. There are also companies that purchase compost from restaurants. Although consumers may instinctively toss things in the trash, creating a recycling and compost system in the kitchen can make a bigger difference. 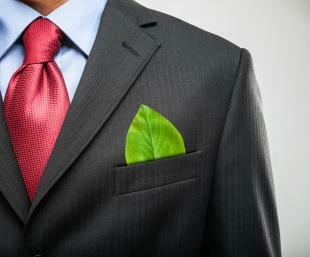 Going green doesn’t always mean that your company has to make major changes. These are a few tips for your hospitality business to be on a path to a more sustainable future! For more information on how your business can be more sustainable, check out these OpenSesame courses!